Here’s an awesome way to get fresh fruit onto a salad that doesn’t feel out of place. It actually feels perfectly in place with warm ocean breezes and tropical drinks in your hand. Guavas are one of my absolute favorite foods, aside from papaya. I used to think I didn’t like fruit, but I knew that just wasn’t right! It couldn’t be. Turns out, I really only like TROPICAL and exotic fruits. Obsessions include papaya, kiwi, dragonfruit, soursop, guava, mango, limes, persimmons…etc. This salad will have you jumping for joy – especially the dressing. Add all ingredients to the blender and whiz until liquid. Sit in fridge until you’re ready to pour over the salad. This is similar to a coconut tofu recipe I made before, just smaller scale. Sorry for the vagueness on amounts. You basically want to make a thick mixture to coat the tofu cubes. Roll each cube of tofu in the egg replacer and transfer to the coconut. Press firmly to coat. Place in the toaster oven for about 10-15 minutes until golden brown. Or you can use the regular oven preheated to 375. Serve over greens of your choice and additional fresh fruit. Here I used up the rest of my papaya, some guava slices and starfruit. Wow, a tropical salad! 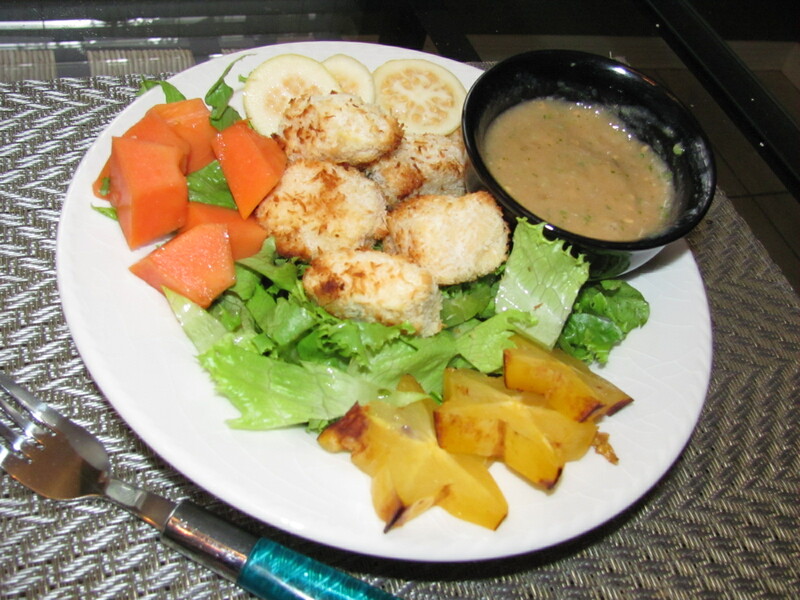 Sounds divine with the guava-papaya vinaigrette! Can’t wait to try this! I love that you used the toaster oven, I’ve never thought of that.